This article is a companion piece to the Safe Pet Toys article offering tips for shopping for safe pet toys. The wide range of pet toys on the market offer something for every pet and every budget. All choices are not equally appealing or safe for every pet though. The age, size/breed, and personality of each pet are important factors when choosing toys for a pet, whether as a gift for your own pets or for other pets in your life. I have heard "my dog does just fine with bones" too many times to count. And, some dogs are fine with bones. Many dogs are not. 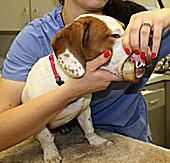 Most of the bones in pet supply stores are hard and brittle, some are filled with a "marrow" treat. The size of the dog, the bone, and how enthusiastic the dog is about chewing and playing with the bone all come into play. Dogs that like to play catch or fetch do better with soft, sturdy toys -- with less damage to teeth and gums. Bone stuck on lower jaw (see photo) or lodged in upper jaw. Bone swallowed or stuck in pharynx or throat. Bone ingested, causing gastrointestinal obstruction or rupture. I am not a fan of bones as chew toys for dogs. The above scenarios often involve surgery or at least anesthesia or sedation to remedy the problem. The risks outweigh the fun. For the dogs who like to chew and/or play catch and fetch, I recommend a durable, non-destructible, rubber bone, ball, or flying disc. Of course, "non-destructible" isn't an absolute, but my dogs have done well with the toys mentioned below. Some dogs chew/ingest any toy though, so as always, supervision is recommended. Kong toys - Large variety of dog toys. Be sure to read labels for weight of dog, age (puppies, seniors, etc. ), and chew durability. Compare Kong toys. West Paw Zogoflex Toys - My review of these durable soft chew toys. Kibble Nibble - Eager chewers can chip away at this toy, use with supervision. Stuffed animal toys - various brands - This type of toy clearly isn't for every type of dog, but my Greyhounds love them and get lots of "chewing" play time in without shredding or eating the toy. Rawhides, bully sticks, hooves, ears, and similar treats may be ok for some dogs, but I don't offer them to my dogs. Possible problems include: ingesting too fast (getting lodged in throat, mouth), digestive problems, and risks of salmonella. Related: See what viewers recommend for pet toys and gifts. Cats and string go together like dogs and bones; a common assumption that everything will be fine, but there are risks here, too. Dragging around a string or a "fishing pole" type of cat toy is fun, and cats love it. Under supervision, this is a great play toy and a great way to get some exercise for your cat. The problem is when the cat has access to string and string-like items when you aren't looking. Everything from yarn, to rubber bands, to that needle and thread in the basket on the counter is a potential risk. A cat was presented to me for "coughing," only to find a silver needle embedded in the back of her mouth, with thread and plastic beads hanging down the throat. Many cats, including some I have lived with over the years, love rubber bands and will seek them out to eat. This can cause stomach or intestinal blockage over time. A cat I treated in practice had consumed large quantities of rubber tubing, causing a large obstruction in the intestine and small intestinal ruptures, necessitating a bowel resection (removal of the affected intestine). Other string hazards are seasonal -- Christmas tinsel, package ribbons, and Easter grass. Once cats start eating a stringy item, the swallow impulse takes over, ingesting more of the string, ultimately causing what is known as a linear foreign body. This can be deadly in some cases. In summary, fishing pole type cat toys or other "string-y" toys are fine, if under supervision. After play time, be sure to put the string away, safely out of your cat's reach. In homes where both dogs and cats (or other pets) reside, it is important to consider if toys are shared, or in the case of my home, small cat toys eaten by the dogs. I purposely keep cat toys out of the dogs reach, just in case.